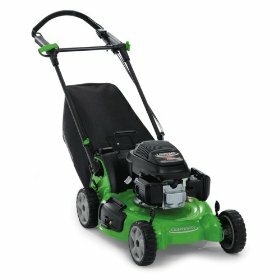 I purchased my Lawn-Boy Insight Platinum Series lawn mower at the beginning of the summer and I have been nothing but impressed. First I would like to talk about the Honda engine used on this mower. This was the main reason I chose this machine over several other options. This engine is smooth, powerful, and extremely easy to start. I have owned Honda engines in the past and they have always given me years of reliable performance. The 21” mower deck is great because it is large enough to cut down on your mowing time, but it is still small and light enough to maneuver around any obstacles in the yard. The Sens-a-Speed self propel system is awesome once you get used to it. The first couple of times I ran the mower it tended to be challenging to turn around at the end of the row, however, once I got the hang of it everything was great. The speed of the self propel is nice as well because its top speed is faster than many mowers, and I like to walk pretty fast. Another nice feature is the pull handle to start the mower. This may sound insignificant but having the full handle is much easier on your hand than the conventional T-style pull handles. Finally, the mulching feature on the mower is perfect. I always hated bagging in the past, but this mower has plenty of power to mulch anything, even if you let the grass grow a little more than you should have. All in all, I love the mower and I am sure it will keep me happy for years to come. I have had this lawn mower for only a couple weeks now, but it is by far greater than all mowers that I have had before this one. The power and precision of the Insight Lawn-Boy is far beyond what I had expected of it. It used to take me almost double the time to mow my yard than it does now and I give credit to this mower for that fact. I did have a Lawn-Boy before this, but it was a far older and less advanced model. The Insight series adds a greater reach of the blade so that I do not have to spend as much time trimming and edging the sides of my yard. The wheels move smoothly across the grass as the blade spins at an amazing rate. With so many different levels and settings for the blade, I can now cut my grass as close to the ground as I want. For me, this is a big deal because I appreciate a fine looking yard. I have quite a large area to deal with and to get every aspect of my yard looking the best that it can, I used to have to use two different mowers; one for the dryer areas with lesser amounts of grass and one for more damp areas with a larger density of grass growing. Now all I have to do is use my Lawn-Boy Insight and I am good to go with my whole yard. If I were to recommend a mower to anyone it would have to be the Lawn-Boy Insight Series mower. Once you purchase this lawnmower, you will never have to buy another one again. A serious lawn man would only be caught using a Lawn-Boy anyways if he knows what he is doing with his yard. Most of the other brands of mowers are not as durable and as efficient as the Lawn-Boy which makes them cost inefficient. My husband purchased this lawnmower and then promptly broke his leg (not the lawnmowers fault) early in the season. We have always had a Lawn Boy Insight Platinum lawnmower as long as I can remember. Now in 30 plus years of marriage we have only had 3. My husband insists that the extra money that this brand of lawnmower costs (it was over was $500) well worth it in the long run. In checking with my neighbors who purchased less expensive lawnmowers they replace theirs every 3 or 4 years, so I guess the longevity does outweigh the costs. After he broke his leg it became my responsibility to mow the lawn. I usually can never start anything with a cord pull, but I can easily start this one! Additionally it always starts the first time I try. The cushioned handle is very comfortable. The Sens-a-speed works well with our lawn that has large smooth areas as well as some bumpy areas. The lawnmower intuitively knows what speed to work at. It moves very quickly over the smooth areas and slows for the tricky parts. I use the bag attachment when mowing the front yard. It is very easy to remove, empty and then reattach to the lawnmower. Now granted I never mowed the lawn before this last summer but easy is easy. On the back yard I use the mulching attachment. I find that the clippings are shredded to a nice small size so I do not have big clumps of grass that will kill the lawn. We have a small shed that we store the lawn mower in. Again this lawnmower makes that easy as well. The handle folds do I can easily get the lawn mower in the shed and it is simple to restore when you are ready to use it again. I am very impressed with how easy this lawnmower is. Unfortunately for my husband who in 30 years always takes the rest of the day “off” because he is exhausted from mowing that practice will be at an end. After seeing how “exhausting” mowing the lawn really is, this summer he can forget that the remainder of the day off and start on my “honey do” list. That will teach him for breaking his leg!